NOW is the perfect time to take advantage of Vicky's SPECIAL OFFER in November! 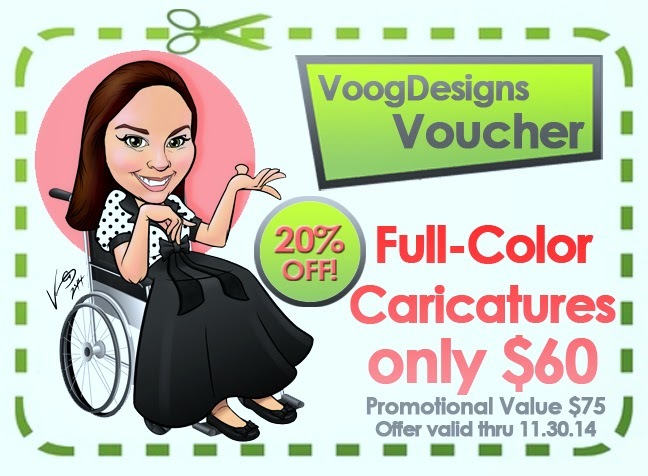 Purchase this VoogDesigns Voucher by November 30, 2014, and get 1 FULL COLOR custom caricatures at 20% OFF our regular price! A single full-color caricature would normally cost you $75.00. But by purchasing this voucher below, you will get ONE CUSTOM FULL-COLOR CARICATURE for ONLY $60! You choose who you want us to draw. It can be for a family member, friend, co-worker or even yourself. It's up to you! After purchasing this voucher by clicking the BUY NOW button below, we will email you to discuss the specifications of your request. This SPECIAL OFFER has been EXTENDED through November 30, 2014 so GRAB IT NOW and redeem it before the end of the month! Time Management. As some of you know, I am a very busy guy. I work a second job Wednesday-Saturday, and on these days I get up at 2:00am to manage the various drawing commissions on my drawing board. Whether it's comic strips, caricatures, or character designs, I'm drawing from 2:00am-5:30am before heading to a second job from 6:00am-6:00pm. Monday I spend most of the day wrapping up commissions, invoicing and marketing. 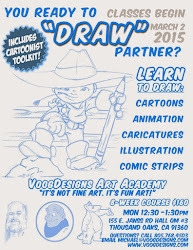 And on Tuesday I teach animation classes for a homeschooling association. I am also a husband and father. So the question is, where do I make time for them? My evenings are dedicated to time with my wife and daughter over dinner and conversation. But the big "Family Day" is on Sunday, which I call "Faith and Family Day". It's on Sundays that I devote the entire day to "Family Time". Over the past year I was commissioned by local author, Travis Escalante, to illustration a fun little story about the importance of family. 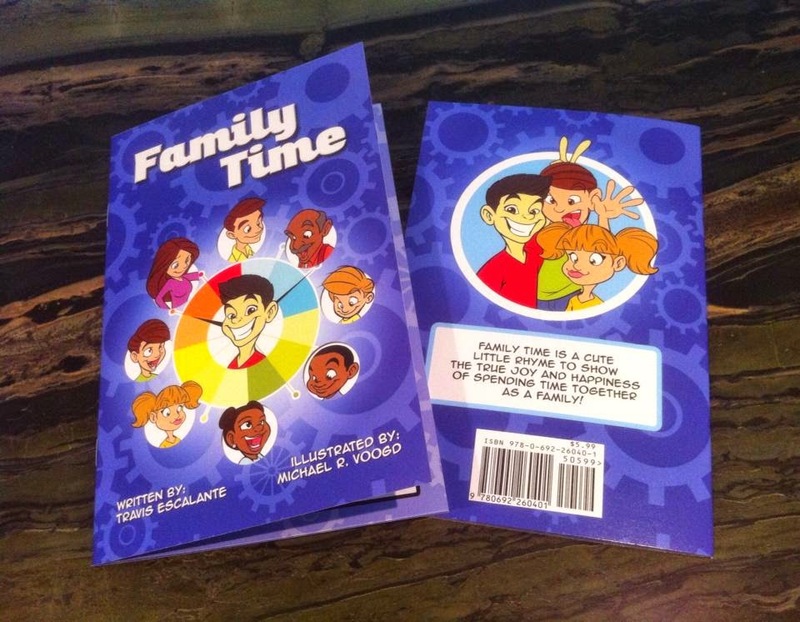 Family Time is a cute little rhyme book to show the true joy and happiness of spending time together as a family! 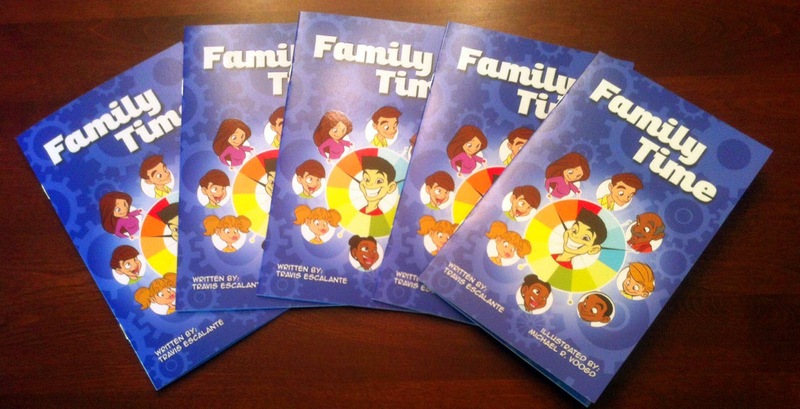 Now you can purchase your own personalized copy of Family Time here! Below are two options to choose from. 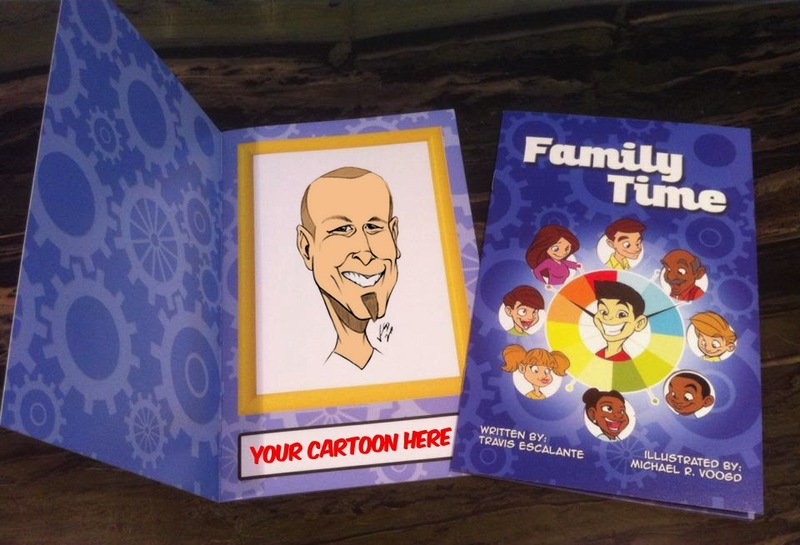 You can have Travis and I autograph and personalize your copy with a special dedication, OR you can request that I draw a custom cartoon of you that INCLUDES YOU IN THE STORY! As a freelance animator, illustrator, caricature and comic strip artist, I'd like to sincerely THANK YOU for supporting our book and helping me fulfill my dream of entertaining entreprenuership through my art. I hope that receiving and reading this book helps you discover the magic of family time! All Souls Day. Dia de los Muertos. The Book of Life. Rich traditions occur in many faiths and cultures, and today I experienced this in a fun and colorful way. After attending weekly Sunday Mass with my family, we decided to see DreamWorks animated feature, The Book of Life, and explain why I give it a "Liked It" rather than "Loved It" rating based on it's Style, Story, and Spirit. Today is November 2nd, and the Catholic church observes this day as "The Feast of All Souls Day", to remember and pray for those family and friends whom have died. In the film, Mary Beth (voiced by Christina Applegate), actually references "November 2nd" (which I thought was an odd coincidence) as Dia de los Muertos, or "The Day of the Dead". This is a Mexican holiday where family and friends gather to pray for, honor and colorfully celebrate their deceased family members. Being a man of faith, it was a pleasure to see the depth of the messages that were related to the audience. Faith. Family. Friendship. Forgiveness. Fortitude. The first moment in the film that piqued my interest was when Mary Beth, the museum guide, delved into the story of "The Land of the Remembered" and "The Land of the Forgotten". This caused me to pause for a moment and think of my own family and friends that have passed away, and it suddenly gave the movie more relevance. I also enjoyed Manolo's journey through the realms, and the charismatic characters he interacts with. It is through his music, his feelings are explained, not just for Maria, but also in a touching testimony to a tempered Toro! He stays true to who he is, and seeing virtues like this is what our society needs more of in my opinion. Overall, I enjoyed this film more for the message and cultural material, than for the animation. 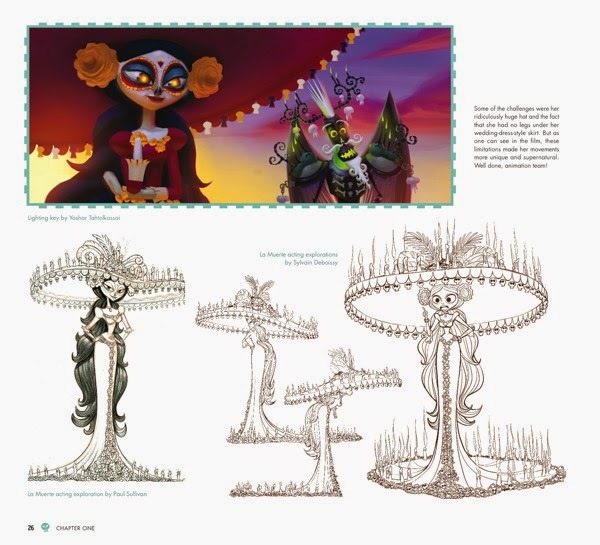 It was Education over Esthetics, and Content over Character Design, which is why I'm rating The Book of Life, as "The Book of "Like". Have you ever wanted to be a Zombie, Vampire or Ghoul? NOW is the perfect time to take advantage of our SPECIAL OFFER in October! 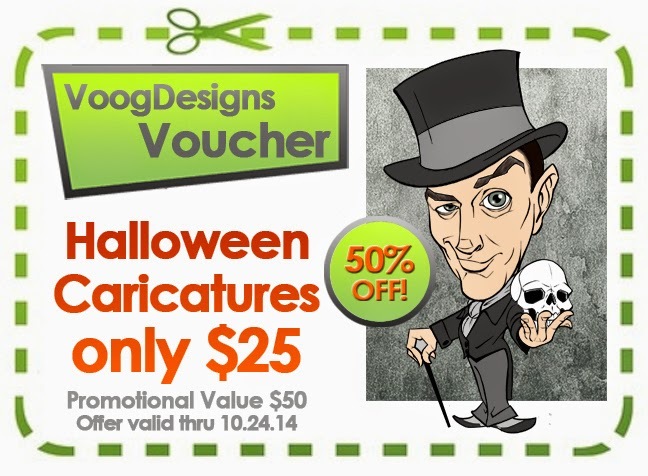 Purchase this VoogDesigns Voucher by October 24, 2014, and get 1 FULL COLOR custom caricatures at 50% OFF our regular price! A single full-color caricature would normally cost you $50.00. But by purchasing this voucher below, you will get ONE CUSTOM FULL-COLOR CARICATURE for ONLY $25! You choose who you want us to draw and what character you'd like it to be. It can be for a family member, friend, co-worker or even yourself. It's up to you! Custom Halloween Caricatures are also great for Party Invitations and Creative Marketing Solutions for any business! After purchasing this voucher by clicking the BUY NOW button below, we will be in contact with you to discuss the specifications of your request. This SPECIAL OFFER has been EXTENDED through October 24, 2014 so GRAB IT NOW and redeem it anytime before Halloween! Looking for a unique gift to give at a birthday, anniversary, wedding, or other special occasion? NOW is the perfect time to take advantage of our SPECIAL OFFER in September! 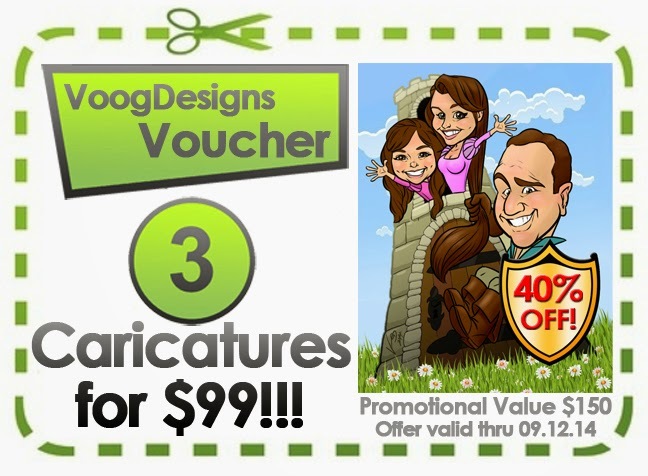 Purchase this VoogDesigns Voucher by September 12, 2014, and get 3 FULL COLOR custom caricatures at 40% OFF our regular price! A single full-color caricature would normally cost you $50.00. But by purchasing this voucher below, you will get THREE CUSTOM FULL-COLOR CARICATURES for ONLY $33 EACH! You choose who you want us to draw. It can be for a family member, friend, co-worker or even yourself. You can have all three people in one drawing, or request 3 individual caricatures. It's up to you! After purchasing this voucher by clicking the BUY NOW button below, we will be in contact with you to discuss the specifications of your request. This SPECIAL OFFER has been EXTENDED through September 15, 2014 so GRAB IT NOW and redeem it when you are ready...there's no expiration date! Recently I had the pleasure of being interviewed by Laura C. who is a first year Media and Animation student at The Art Institute of Orange County. For her report, she was required to interview someone in the Animation Industry to get an idea for the field and the types of jobs that are available. In the next series of posts, I will share with you the questions she asked me and my responses based on my journey and perspective as a Freelance Artist. Please feel free to comment below with any questions you may have for me, and I would be happy to answer them for you. How long did it take to get your business up and running? I realized the first thing I needed was a website to promote myself, and some business cards for my face-to-face meetings. After launching my website I started scanning in my old drawings just for visual stimulation to give viewers a taste of my style. Then I searched sites like craigslist.org for people that needed artist to hire. 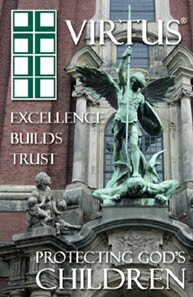 I was professional in my email responses to their ads, and always included my new website for them to view my work. I knew that if I could get them to reply to my emails, and begin a conversation with them, that I had a chance. And sure enough, within the first week I started receiving personal replies and offers. In fact, two of my current clients I found on craigslist, and I am still working with them 3 years later! Remember, it’s all about presenting a strong portfolio, and NOT necessarily about having a degree! People don’t care that I have an Associates in Art Degree. What they care about is what they see in my portfolio and what they will expect their projects to look like. A-B-C… Always Be Closing. Or put another way, “Always Be Creating”. One thing I learned from my former sales jobs is to keep your “pipeline” full. Which means to always have projects that you are working on, while continuing to pursue new clients. If you just settle on working with your existing clients, you neglect your next paycheck, which you will eventually need. With this mentality, I have been able to avoid potential setbacks. Is it ever hard to find new clients? Owning your own business sounds like the dream. What made you want to open your own company rather than taking your talents to a studio? Back in the late 90’s studios began changing how animators were contracted. Rather than hiring them for a period of years, they hired them per animated picture. When the film was completed, many of these animators got laid off and had to reapply to get onto the next film. In a scramble for these out-of-work artists to make a living, it became very difficult for new talent to get hired by studios when all the veterans were completing for the same jobs. At the time it was still a very young Internet and portfolios still needed to me printed and mailed. It was very discouraging and so I lost interest in my pursuit. Between 2000 and 2009 I pretty much stopped drawing. I would doodle a little here and there, but nothing serious or consistent. These moments however, reminded me how much I loved to draw and that I was good at it. And it was during these 10 years that the Internet came into it’s own and websites were popping up left and right. So I began thinking this idea through on how to practically make it happen. I realized, “I can draw the images, but what niche do I want to focus on? I know how to create a website to display my artwork, but how will I attract customers? How can I advertise my services on a very limited budget?” You probably already guessed the answer... SOCIAL MEDIA! With Social Media I could have unlimited viewers! My friends and family would be happy to promote my services to their circles of followers, and best of all…IT’S FREE! My vision was coming together, but more importantly, I BELIEVED I could do it. And with that conviction, I grabbed a composition book and began writing down every idea that came into my head as to how I would make money with my art. Nothing was left off the table. I became a jack-of-all-trades so to speak. What sparked your interest in animation? What main type of art/animation do you do? It was the summer of 1988, when my family embarked on a road trip around the United States. At 13 years old I already had a fondness of hand-drawn animation, but it was when we visited the newly constructed Disney MGM Studios in Orlando, Florida that I knew what I wanted to do. The attraction was called ‘The Magic of Disney Animation’. At the time you were able to watch real Disney Animators at work from behind a glass curtain after viewing a short movie on the process of creating an animated movie. Once I stepped in, it was a slice of heaven for this young artist with a love for cartoons. I enjoy creating 2-D hand-drawn animation, but also enjoy the visual beauty of what is now being created with CG animation. What these talented animators are able to create with computers is truly amazing. Yet, you must always remember that the software is just a tool. The computer DOES NOT animate a scene on it’s own, just like a pencil doesn’t draw a picture on it’s own. It’s the vision of the artist that uses these tools to create the illusion of life that viewers see on screen. Tell me a little more about growing up an artist and your journey into owning your company. Was you family supportive of your artistic ambitions? From my recollection, it was subtle support. They would often praise my work and encourage me to continue, but I never felt they forced or pushed me to draw. I think they recognized that I enjoyed doing it, and allowed me to embrace that peace and happiness when I would draw. To their benefit, drawing also makes for a great babysitter when your parents have stuff to get done around the house. It would occupy my interest for hours, allowing my mom to cook dinner and clean the house without being distracted, which I am sure she was grateful for. But as with any parent that wants the best for their children, as I got older they did encourage me to go to college and earn a degree, just in case I needed something to “fall back on”. So I attended a local community college and earned an Associate in Art Degree right after High School. Simultaneously, I attended the California Art Institute as a way to develop my figure drawing and quick sketch portfolio, which were standard requests when applying to animation studios. It was during this time that I had my first epiphany. A “degree” means nothing if your portfolio is sub-par. You can receive high grades in all your art classes in college, BUT it really is your PORTFOLIO, the proof of your work that sells you to the studios. Another way to put it is that studios will hire you more on the work in your portfolio, than the grades you received in school. There was a vast difference between art classes in a local college and that of an art instruction school. Where colleges teach Art History, Color Theory, and drawing pretty shapes with shadows and perspective, the classes at the Art Institute were not based on grades, but developing your work to strengthen your portfolio. A few years ago, I attended a seminar by a veteran in the Animation Industry who said something in his lecture that I completely agree with. He said, “If you have been told to get a college degree so that you have something to “fall back on”, this is subliminally telling you that you will not succeed.” In essence, you will never put forth your entire effort because you have a safety net; something to fall back on. It’s when you don’t have a choice, when you HAVE TO succeed, that’s when you become intensely focused with unwavering dedication and determination. That’s when you succeed.